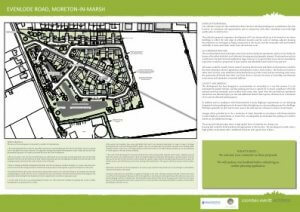 Land to the east of Evenlode Road, Moreton-in-Marsh has been earmarked for development by Cotswold District Council. The land is owned by Gloucestershire County Council. SF Planning in conjunction with Gloucestershire County Council is carrying out a drop in consultation at Moreton town library on Thursday 5 July 2018 between 3.00pm and 7.00pm. If you are unable to attend on 5 July you can now download the event display boards towards the end of this page. 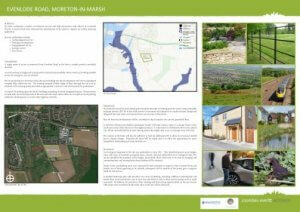 Once you have viewed the display boards please download and complete our feedback form. The consultation period will run until 19 July 2018. Please see the link below for our privacy statement. The emerging Cotswold District local plan is the document that sets out the strategy for future growth within the district up to 2031. 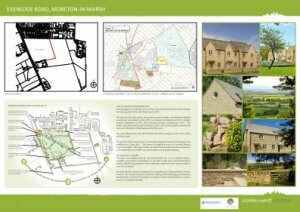 The plan has been the subject of extensive rounds of public consultation from May 2013 through to and including this year. The plan allocates the land off Evenlode Road for housing to meet some of the identified need. The plan has been reviewed by a Government Inspector and his Final Report was published on 5 June 2018. The Inspector has concluded that the plan is sound, and the land at Evenlode Road is suitable to accommodate a housing development. The land has been declared surplus to the requirements of Gloucestershire County Council. The County Council is therefore seeking outline planning permission for development of the site for housing in accordance with Cotswold District Council’s soon to be adopted local plan. We are therefore proposing to submit a planning application to comply with the District Council’s policy and would like your comments once the consultation begins on 5 July.